Arrange the dough discs on a clean table or work surface. Shred the chicken breast and add it to a container. Mix the celery, carrot and green onion with the shredded chicken. Add a tablespoon of this preparation to the center of each disc of dough. Wet the edges of the discs and close with your fingers, pleating the borders to be sure the filling doesn’t leak out. In a pot, heat the chicken broth. Add the dumplings to the soup along with any of the remaining veggies. Incorporate the mushrooms. Check broth seasoning and add salt or soy sauce, if necessary. You can use different ingredients in the filling, such as pork or other veggies. What do you know about dumplings? These dumplings are similar to empanadas, but covered with much softer dough. They are most often steamed, sometimes fried. 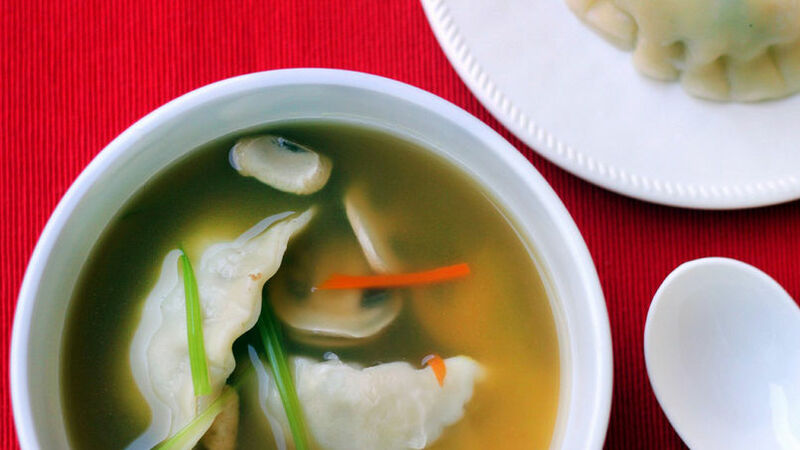 In this recipe the dumplings are cooked in the same soup broth. You can prepare a large batch of dumplings ahead of time, cooking up some with this soup, and freezing the remaining dumplings for a future meal. These dumplings can be added to any flavor broth for a complete main meal, or boiled and served on their own as an appetizer. You could also enjoy these dumplings with a red dipping sauce; however, I’m sure once you’ve tried them in this soup, you’ll vote for this combo the next time dumplings come up on your weekly menu. What other ideas do you have for stuffing these dumplings?